When I was a kid, my family spent summers on long road trips, staying in motor lodges and campsites and exploring roads less taken. Now that my kids are growing up, summers are filled with Julie’s swim team and Graham’s soccer practice, robotics camp, and part-time job. A three-day weekend is an exciting treat, and my husband, Tom, and I wanted to make the most of this one. 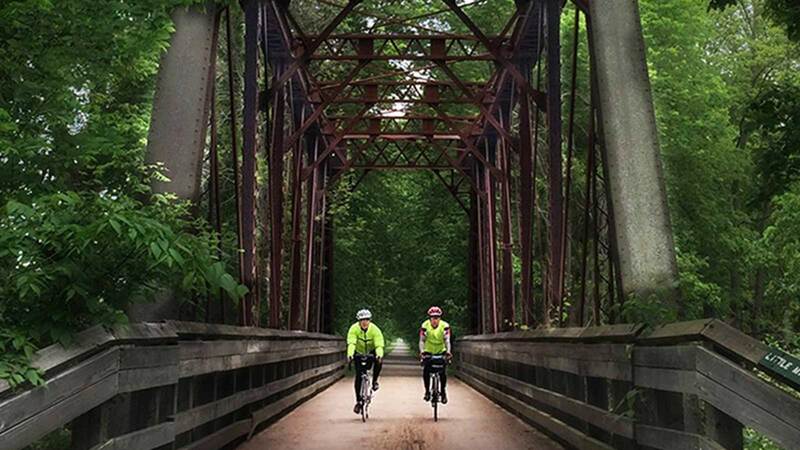 We heard that Greater Springfield, Ohio, is a hub location for more than 300 miles of paved bike trails, so we decided to embark on a family road trip of our own. We loaded our bikes onto the car and headed to unwind. The Courtyard by Marriott Springfield Downtown is a long way from the roughing it I experienced on road trips with my parents, with its stylish lobby and our comfortable suite—big enough for the whole family. I knew it would be the perfect home base to come back to after a day of adventure. Right across the street, the stone façade of the Heritage Center Museum caught my eye as we headed out to dinner on our first night. The impressive clock tower on the 19th-century building told me that this has been the center of the town for generations. A 10-minute walk winding through charming neighborhoods and past a granite statue of Madonna of the Trail took us to our first destination: Mother Stewart’s Brewing Company. The micro-brewery—located in the historic Metallic Casket Company factory—offered a wide variety of craft brews and an outdoor beer garden in which to enjoy them. Food trucks had set up shop outside, offering locally sourced fare without any fuss. As I sipped on a Witbier and Tom enjoyed a Vienna Lager, the kids indulged in a Frostop root beer. Summer twilight stretched on for hours. Even after we had chatted, laughed, and eaten our fill at Mother Stewart’s, we still had plenty of time to wander up to Veteran’s Park, where the Springfield Summer Arts Festival promised complimentary music and delivered a coterie of families and friends sitting in lawn chairs and on blankets, swaying to the beat in the waning light of the workweek. Saturday began with plans for taking in the town by bicycle, but we couldn’t resist the Greater Springfield Farmers Market when we saw the bustle around the Heritage Center Museum from our suite. Fresh fruits and vegetables and brightly colored artisan crafts abounded, but the smell of freshly baked bread called to Julie and me. We bought a loaf and some farm-fresh butter while Tom and Graham grabbed coffee and smothies inside the Heritage Center. Sitting outside and watching the community come together on brick-paved North Market Place was the perfect way to start our day. After enjoying our fill of bread, we were all itching to stretch our legs, so we headed toward the Little Miami Scenic Trail. The path—well-maintained and family-friendly—traverses lush greenery under the shade of trees. Riding south out of downtown we caught glimpses of the Little Miami River throughout the ride—Tom and I reveled in competing to see who could spot it first. Graham and Julie raced ahead, with Tom in close pursuit. I trailed behind, distracted by a field of pink flowers shaped like badminton shuttlecocks, feathery petals falling behind the fuzzy, orange center thrusting skyward. The morning passed swiftly. By the time we reached Yellow Springs, we settled in at the Sunrise Café for a delectable brunch, including fluffy omelets and Bloody Marys bursting with flavor. Afterward, we decided to take in a local landmark, John Bryan State Park, where we hiked past steep rock faces and across wooden bridges—every footstep echoing rustic charm. We passed spots where water trickled over rocks like miniature waterfalls, glistening in the abundant sunshine and splashing into the clear pool below. By the time we biked back to our hotel, we were blissfully exhausted from the day’s adventures and ready to rest. We had so much fun on our bikes that we decided to spend our last day in Greater Springfield exploring even more. We picked up sandwiches from a downtown café and headed toward the Buck Creek Scenic Trail, another picturesque bike path that took us through forests, past lakes, and over bridges before we landed in Buck Creek State Park. Graham brought along his Frisbee and—worried that I would feel left out—taught me the basics of disc golf. It sounded easy enough, until I saw the number of trees between me and my disc’s target: the yellow-capped basket a few dozen yards away. I won’t be turning pro anytime soon, but spinning the disc with all my might while my children and husband cheered me on made me dizzy with laughter. Julie had heard about the ECO Sports Corridor, so when it was time to pick a place to have our picnic, we biked to a spot where we could just see the white water rapids of Buck Creek. Having mastered disc golf, I was readily persuaded that it was a must to try kayaking the next time we visit Greater Springfield. Our last stop before heading out of town was the Mad River Gorge and Nature Preserve. While Julie and Graham geared up for some rock climbing, Tom and I enjoyed a quiet hike to the river. As the sound of our conversation was slowly swallowed up by the roar of the river, I realized that nature is as powerful as it is beautiful. Riding our bikes back toward downtown Springfield, our muscles sore and our thirst for adventure quenched, I felt content knowing that these were the memories my kids would look back on when they were my age—memories filled with sunshine, laughter, and family. Have any plans for your weekend? We do. Find your unwind on an active getaway to Greater Springfield.